"All the sweet, beautiful and nice things in life." Don't you love the gentle turning of pages as you make your way through a new magazine that's got lots of interesting things to read and beautiful pictures to pore over (especially when it's not brimming with advertising)? What about a magazine that lifts your mood into something festive, inspirational and just plain, every day happy? All because it's filled with pages that suddenly make you want to get up and do something creative and fun? Like baking an orange and lemon cheesecake with raisin and walnuts... or painting bright, beautiful butterflies on canvas for your bedroom wall... or making your own series of whimsical postcards to send out to old friends and neighbours you haven't seen in ages and ages. That's exactly what Daphne's Diary does. It's a brand new find for me... but according to the info I found at InPublishing, this delightful magazine was launched in October 2013 and is published every six weeks. I found it here in Canada at Chapters Bookstore. You can learn more on their Facebook page and website, where you can also order a subscription if you like. Oooh, I wonder if I can find it in Britain! I forgot to mention that the version I have is from the UK... so yes, you should be able to find it in Britain! I've seen the last two issues at the book store (where I pick up my UK Country Living). I've leafed through it, but haven't purchased it yet. I'll be interested to hear what you think about it. Love the target audience - describes so many of us to a T.
I bought this magazine about 3 weeks ago at Chapters. It is so beautiful and having very little advertising is definitely a bonus. I haven't seen a new issue recently but will have to keep checking. 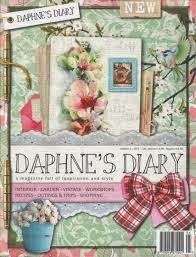 I'm glad you shared your find because I know many other ladies would enjoy Daphne's Diary. Growing up, reading was very hard for me. I couldn't comprehend chapter books. It wasn't until I pick up a magazine that I found a way to LOVE reading. The articles were short and the pictures were fascinating. That's when I fell in love with magazines! Can't put them down! Thank you for sharing a NEW one for me!! A magazine that sparks creativity, now that is a great find! ...and more magazine that ads, that's a bonus. A new magazine like this is sometimes almost like having a friend in to share a cup of tea! We smile and get inspired together. I need to check out our local Chapters store in Kitchener-Waterloo to see if they carry it. Hi Brenda, I found the latest copy of Daphne's Diary (the one you show in your post) this afternoon so now I gave 2 to enjoy! I got it at Chapters in Oshawa in case anyone else in my area is looking for this lovely magazine.